On to the music of a stateless nation. 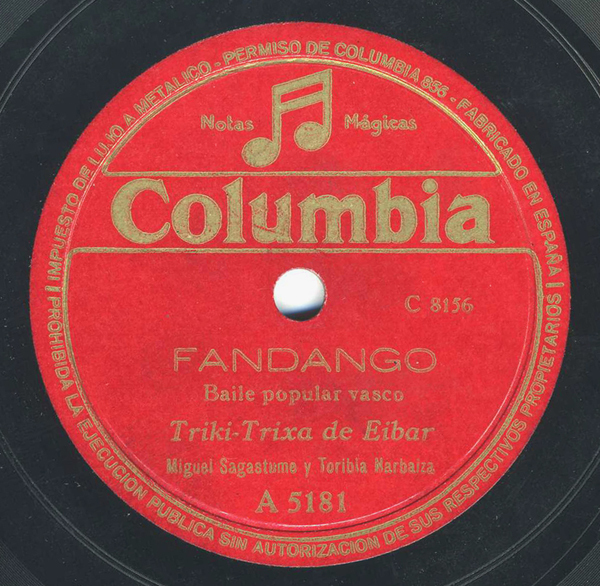 At first, this baile vasco starts off with a typically enjoyable folkdance melody featuring the pandareta, the Basque tambourine, and the regional diatonic accordion, the triki-trixa. But it’s the beautifully jolting vocal performance by Ms. Narbaiza that’s the real stunner. Whether Columbia’s engineer, who recorded these musicians from Eibar in what seems to me to be the early 1930s, had the microphone up a little too close, or whether Ms. Narbaiza’s energy simply couldn’t be contained is something we’ll never know. The music obviously speaks for itself.